This is a wonderful alternative to the vinaigrettes! It is a hearty, savory salad that is lightened with a mild lemon zest. It is a perfect accompaniment to steaks, chicken and either tuna or swordfish steaks. It takes a little time to prepare, but you get the time back since you don’t have to add salad extras. My sister, Kathy, CLL Recipe Tester, made this last night, served it to her 20 year-old son, and he loved it! 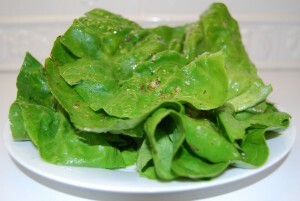 2 heads of Boston lettuce, or other soft lettuces like red or green leaf lettuce. (Boston featured in photo). Carb Light Living™ Tip: If you don’t have a mini or small food processor, it’s worth buying one! It saves a lot of time.